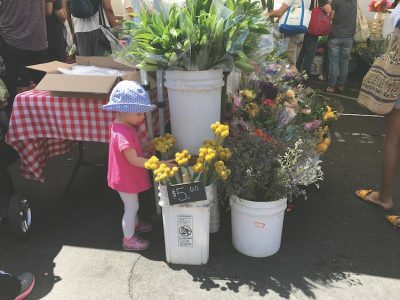 TODDLER examines beautiful yellow flowers at one of the flower stands at the market. Supermarket shopping is not exactly an engaging activity. Rather, it’s a tedious one. The best you can hope for is navigating the aisles successfully and getting out as quickly as possible. Especially in a modern and technologically advanced city like Los Angeles, it can be fun to do things the old-fashioned way. Shopping at the Larchmont Farmers Market is a refreshing escape from the stress of modern life. This isn’t your typical shopping expedition. Instead, it’s a fun and appealing outdoor activity, open every Sunday from 9am to 2pm located in the parking lot, by the village clock tower. Complete with samples, the market has a friendly vibe and features all sorts of deliciously fresh produce, prepared food such as the admired original cheese crisps and delicious crepes, and even various other goods such as jewelry and flowers, all found in humble and open booths. Unlike your run-of-the-mill supermarket, you’ll always leave wanting more. Along with Chloe, there are many other children who go with their families. It is not uncommon to see a child helping his or her parents by selecting items, or carrying purchased products. Roger Morrison, who lives on Las Palmas, shops at the farmers market every week and then uses those ingredients such as fish, which he gets every week, to cook Sunday night dinner. He likes how the market is fresh and local to where he lives, and says he brings his kids all the time. Shoppers always seem to be enjoying themselves, and numerous vendors have regular customers who visit their booths every week. Kathy Dominguez, one of the vendors at the Underwood Farms stand, has definitely seen her share of familiar faces. Ace Ranch, another farm stand, is popular for its year-round Hass avocados, as well as seasonal large Reed avocados. FAMILY buys avocados from Ace Ranch. The main attraction of the marketplace is of course the food. Summer brings in new produce such as avocados, blueberries, corn, peaches, carrots and much more. Ms. Dominguez from Underwood Farms says their most popular item right now is corn, which made its first appearance of the year July 1. Cortez Farms, another farm stand at the market, is popular for its blueberries. Regular customers stock up by the box every week. In the entire market area there are typically around 30 prepared food stands, 15 farm stands and a few other non-food products. Molly Litvak is an incoming Sophomore at Shalhevet High School. 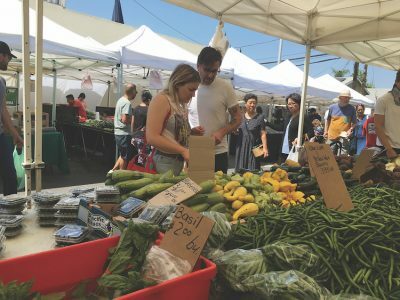 Entrepreneur manager Jennifer McColm, creator of the Larchmont Sunday Farmers Market and 20 other farmers’ markets throughout Southern California, opened her latest local market — this one for Saturdays — last month. The market is to be set up weekly in the parking lot of the Sweetgreen health food restaurant chain’s location at 180 S. La Brea Avenue (the former Sonora Café and City Restaurant building). 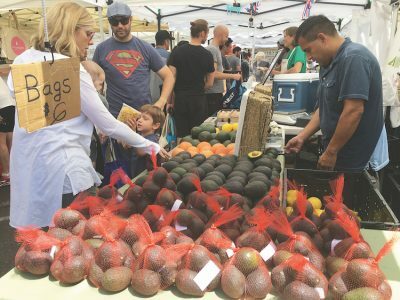 The market is being called the “La Brea Farmers Market” and is scheduled to host approximately 35 vendors every Saturday from 9 a.m. to 2 p.m.